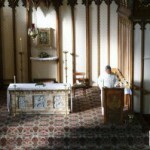 A s well as times of liturgy, St Cuthbert’s Church is open for prayer on Fridays until 3:30 pm and on Saturdays until 12:00 noon. At other times, please ask at the Chaplaincy/Parish Office. All are very welcome at celebrations of Mass and other Liturgical celebrations. 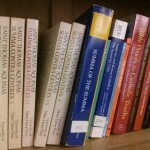 with books of general theological interest. Access to the Chaplaincy Room is via the passage behind the church. 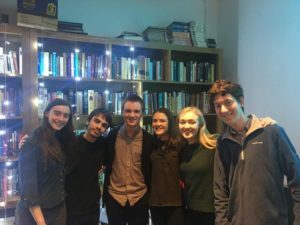 A keycard access system has recently been installed, so students can gain access at any reasonable time – and the Chaplaincy is fast becoming a popular space for to meet and study. Keycards are available, for a £10 deposit, from the Chaplaincy/Parish Office. WiFi internet access is also available. You even can pay the KeyCard deposit online via PayPal by clicking here – we’ll let you know when the card is ready to collect. Students and parishioners can borrow books from the Chaplaincy library – see the Library page for details and to search the catalogue. 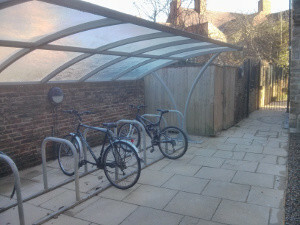 The Chaplaincy has a bike shelter behind the church, which can be accessed via the same keycards which give access to the Chaplaincy Room. Although the bike shelter is behind a locked gate, bicycles are left at the owner’s risk, and a secure bike lock is recommended. 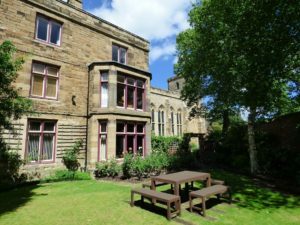 The beautiful garden at St Cuthbert’s is available for use by students for reading, study and relaxation – a great quiet resource especially for Easter Term!